My Name is Lizzie - and this is my little space on the internet to talk about everything I love. Food, Beauty, Travel, Interiors, and Lifestyle. This is the rudest looking curling wand I have ever seen. Not gonna lie...it looks like I've left something intimate on my dressing table! 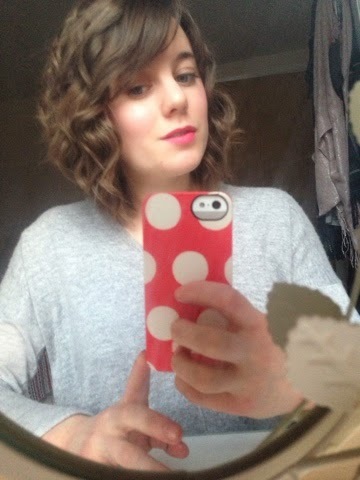 Since my hairs grown a little bit recently I've really been into curling it. However I've always just done that with my straighteners as it was a nice simple way to add some curls without to much faffing around. But every now and then my curls would look dull or an odd shape due to the shape of the straighteners. So when I spotted this strange looking contraption for £24.99 from Boots (reduced from £29.99) I thought why not give it a little go! I'd already watched a few tutorials and read a few reviews on this particular curling wand as I wanted to see what kind of waves it created and how easy the appliance was to use. The wand comes with a protective glove and has a digital display with your chosen temperature. It heats up within 40 seconds and has an array of temperatures to choose from. And a very handy little stand attached to the handle so that it doesn't touch the surface your storing it on. The wand is infused with Diamonds so it gives your curls shine and a smooth finish. 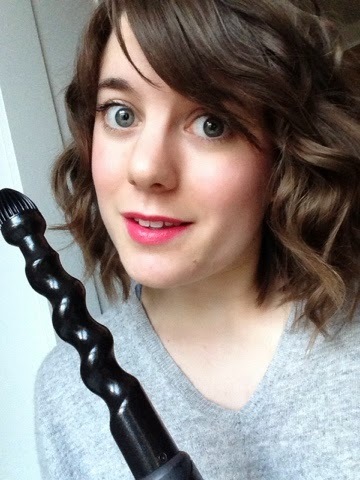 I love the finish of the curls with this wand! It works great on my hair and the curls stay in all day. I'm still trying to get the hang of the technique. It needs to be used upside down...but I keep getting muddled up with which way round it goes so the hair slots into the pattern, or I have the glove on the wrong hand! I love the tight curls you get with this tool and the volume it creates too. I feel it will look better when my hair grows a few more inches as it creates so much volume that it makes my hair look quite 'poofy.' So I feel a bit more weight to my hair will loosen things up a bit. Even after sleeping on it, I still had smooth defined curls but with a looser finish. Have you tried this wand yet? What do you think?